I’ve been using your web site for more than 5 years now! I really appreciate all the work you’ve put into it. We take our granddaughters out every year to see the lights, and I map it all out and program my GPS based on your site, so I thank you very much. On behalf of our grandchildren we would like to thank you for your wonderful web site. Each year on December 23rd our four grandchildren come to our house for a slumber party. We spend the evening driving around Concord and Pleasant Hill looking for houses decorated with Christmas lights. As one of them said 'it's tradition'. We have our favorites like 876 St. John Circle in Concord - 'the Jack house; and 5208 Olive Drive in Concord. Your web site allowed me to plot our route for this year. Directions from one house to another in a logical and gas saving route. No more driving aimlessly around the city looking and hoping to spot a spectacular display. I wanted to write to you and thank you for creating such an awesome web site! Not only does it provide incredibly useful information, it is also one of the best set up and easiest to navigate sites I've ever used. One of my daughter's favorite things to do at Christmastime is drive around looking at Christmas lights. With the help of your site, we found enough incredible light displays to cover 2 trips - one to San Jose and another to Santa Cruz! Some of these houses were pretty nestled away, so I'm glad you had everything mapped out. I know what you do is a labor of love and I wanted you to know people appreciate what you are doing. I just wanted to say thank you for putting together such an amazing website! My friends and I spent the weekend traveling around Sonoma County looking at Christmas lights and used your listing as a guide. The "must see" designation for the house/neighborhood 1190 Cielo Dr in Rohnert Park was spot on! Amazing! Another house in Santa Rosa was much smaller, but what it lacked in lights, more than made up for in mechanical ingenuity; truly amazing and brilliant! Lots of animation and done in away that would be reminiscent of something you would find in the 50s or 60s. Just wanted to email you and thank you for another great Christmas season. Visitors to our display this year were literally off the charts. We have a sensor that trips to activate things in our display when visitors walk up into the yard. The sensor went off over 1,500 times. Multiply that by the average family size of 4 that came up and that's over 6,000 people walking through the yard since 12/4/11. That's not even counting drive by viewers. We did our Santa Claus night on 12/23/11, and quite a few people mentioned that they found us from the California Christmas Lights website. KZST radio also did a live broadcast from in front of our house and apparently mentioned their Christmas lights tour map, which links back to CCL. Since you have been posting us on your website, the visitors to our display have steadily increased. Our display is a gift to our community and we want to share it with as many people as possible. CCL has a key role in making this possible. Hope you and your family had a very Merry Christmas and wishing you good health this coming year. Wonderful, wonderful, wonderful -- Viewing the lights is a big part of our family Christmas tradition. You make it so much easier to do so. Just a wonderful gift to the community. Thank you so much. Our all time favorite is Mr. Xxmas on Olive in Concord, CA - He and his house are the best! I love your website and want to THANK YOU for all the work you put into it. It really helps me with taking the kids out to see the lights, and prevents us from wandering around aimlessly and wasting gas. The kids don’t get bored when we have specific destinations to go see. Oh, another comment. The kids get a thrill from the FM Broadcast locations so we especially like that you flag those on your list. I can't thank you enough for this wonderful site that has saved me lot of my time. I was planning to take my 3 year old out to show her the lightings during the holiday season and your site has made my life much simpler. Keep up the great work and thank you again for all your time and effort in creating and maintaining this website. Thank you to you all for your extraordinary website. Also, thank you for featuring our Live, Drive-Through Nativity this year. The Nativity attracted nearly 1,900 people over four nights. Many of them indicated that they heard about the event from the California Christmas Lights website. Thanks, again, for this great service to people who seek to celebrate this wonderful season in positive ways! This site is amazing! I ran across this site just a few days ago and am sooooo glad it’s there. My husband and I were actually going to houses that we happened to see on our way to eat and stuff. But this site has been extremely helpful. It has saved us from lots of needless driving around and we used that time to actually seeing wonderful, beautiful lights. I love looking at Christmas lights and this was beyond wonderful. We have made ‘light seeing’ our mini pre-vacation before our actual vacation this weekend. It has truly been an adventurous, amazing, beautiful and spectacular time. You’ve done a very very wonderful job and we’re grateful to you for the time and effort you put into this. Also, a big thank you and wonderful job to those who decorated their homes. You’re all so creative and have done a magnificent job. A huge round of applause to Alex and decorators. Thank you all!!!!!!!!! I just heard a great plug for your site on KOIT 96.5. I'm telling you, you're like a "Christmas angel" to all of us who love the lights. We went out to Deacon Dave's last night and San Ramon to see the Ascot house with music, that was great. I'm hoping to get to Santa Clara to see some of those homes, they look fantastic. By the way, my buddies on San Antonio Av in Alameda are so thrilled that you listed them as the [Alameda Kiwanis] 2007 Grand Prize winner. With all the tragedy and sad stuff in the world it's so nice to have a season we all love and to be able share it with others. I hope you and your family will have a wonderful Christmas and very Happy New Year. Tis the season to find fantastic things! I can't believe I've never stumbled upon your website until this year! It's fabulous! Thank you so much for compiling all this. The website is VERY user friendly. Nice and clean too. I've just passed it along to almost everyone in my address book! I'm also bookmarking it for next year too! I love how I can look at all the lovely lights from all over Northern California from the comfort of my home. Granted...I will be driving to some of these places...but it's nice being able to look without HAVING to drive! I see what I want....and the really nice ones, I can go see it for myself. I saw the photo and article in the Contra Costa Times and am glad I did! Your website is awesome! It is so helpful to see photos of the houses, so that we can choose what we want to see! God bless you for all that you do to keep the Christmas spirit alive and well in Northern California! Alex, I learned of your website just this morning when I read the Contra Costa Times and there was an article on you and your web site. What a fabulous web site! It is extremely user friendly and just what us holly, jolly folks needed. We go light-seeing every year with another family and this site will be most helpful in making our route choice each year. I am so happy to have found you! I am a 63 year old Nana living with my daughter, son-in-law and grandson and I can’t wait to show them your site tonight! 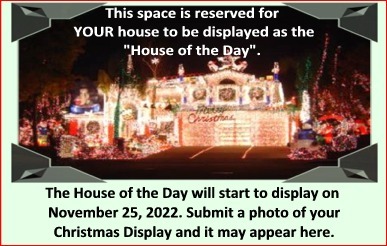 The display on your home is great! A million thanks to you! I can't emphasize enough how much we appreciate your service to the valley and to our church! You are a virtual internet Santa! May you have a merry Christmas and may the Lord bless you! We relocated here in the East Bay 1 1/2 years ago and just the other day I said to my husband that I wish there was something published in the news about decorated homes to see at Christmas time. I was so excited this past weekend to see in the paper a column about you--just what I was looking for! What a wonderful service you are providing for so many people in so many ways. I was pleasantly surprised to see how detailed and organized your site is. Thank you so much for all the time and effort you have put in to this project, which is such a caring and giving thing to do. May God richly bless you for your kindness! We used to live near the Dana Highlands home in Danville. We are now in the Kansas City area and can say...these folks DO NOT know how to decorate. We enjoy staying in touch with our old neighborhood by seeing the photos on your site. HELLO FROM WEEHAWKEN, NJ!!! SITTING ON MY 4 WHEELS AND "TRAVELING" AROUND YOUR NEIGHBORHOOD SEEING THE SIGHTS AGAIN THIS YEAR. IT HAS BECOME MY OWN FAMILY TRADITION FOR A FEW YEARS NOW CAUSE I CANNOT GET OUT AT NIGHT. YOUR SITE IS GROWING BY LEAPS AND BOUNDS AND WILL KEEP ME BUSY FOR HOURS ALL THROUGH THE HOLIDAY SEASON!! MANY THANKS FOR ALL YOU DO AND I JUST WANTED TO SAY IT AGAIN. MERRY XMAS AND A BLESSED NEW YEAR TO ALL OF YOU. I'd first like to thank you for creating such a wonderful web site. Every year we would drive around countless hours and gallons of gas looking for a houses that took the extra time and effort into decorating for the holidays. Your web site was just the thing we were looking for. THANK YOU. I'm also trying to encourage other Milpitas residents who have gone the extra mile to submit their homes to your web site. Wanted you to know you did a " knock-out " job on putting this site together. It is a blessing for shut-ins & elders who can't get to these locations. Hello there. First off let me just tell you how appreciative our entire family is for all your hard work with the site. We have enjoyed it for many years and tell everyone we know about it. For you to do this out of the goodness of your heart is such a perfect example of the holiday season. Much thanks for such a gracious gesture. Your web site is absolutely, positively spectacular. Thank you soooooooooooo much for devoting your personal time to do such a fabulous job. A FRIEND SENT ME THIS ADDIE TO SEE THE LIGHTS. WHEN I WAS A KID WE ALWAYS WENT DRIVING TO SEE THE XMAS LIGHTS. I AM SURE YOU HAVE HEARD THAT A MILLION TIMES. lol . WELL I AM IN A WHEELCHAIR NOW AND 56YRS. OLD AND ENJOYED MY "DRIVE" TO SEE THE XMAS LIGHTS THIS YEAR. FIRST TIME IN A LOOOONG TIME! THANK YOU! My wife and I would like to thank you for all your hard work. We were out last night using your guide and came home in the best Christmas mood ever. Thanks again and a Merry Christmas to you and your family. An important part of the holiday season for our children has been driving around and looking at Christmas lights. Until a few years ago we lived in SoCal and knew all the "good" places to view neighborhood light displays. Since we moved here to the Bay Area, it's kind of been hit and miss. I've been searching newspaper sights and TV station sights for a list such as yours without any success. I'm soooooo glad I Googled and found your site. I can't thank you enough for your time and energy that you've put into helping to make some new Christmas memories for our family. I hope you have a blessed and joyful Christmas with loved ones near. Your site is wonderful! I loved looking at all the homes from the warmth of my computer room before venturing out one evening in search of the "good ones" before my family and friends arrived and wanted to ride around and check out the great houses we have in our area. You've made my job so easy. Again, thank you for the visual tour. Thank you very much for this colorful, musical production of some of the valley light displays! It's great! Plus saves on fuel and congestion on the roads, not to mention pollution! I learned about you site in the Tri Valley Herald this morning and could hardly wait to turn the computer on to see the houses. So thanks, you will also make a lot of people happy this year with your special site. I think it will be especially meaningful to the people that are unable to get out and enjoy the lights, they can just enjoy them at home. Happy Holidays HO!HO!HO! Just wanted to tell you how much I enjoy your website. I am from near Pittsburgh, Pa. and wish we had such a cool website in Pa.! Keep up the great work! I'll look forward to your updates.